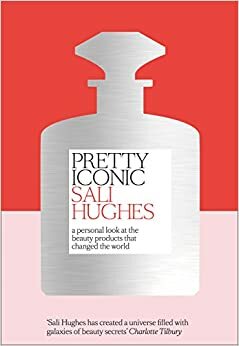 One of the few times I made an exception to my rule of only reviewing fiction on my blog was when I reviewed Sali Hughes' Pretty Honest - and I've decided to make another exception for Sali's second book because Pretty Iconic is such a very special (and I think unique) book that I want to tell people about it. Sali Hughes is a journalist who writes about a whole range of subjects including politics, film and women's issues and is also well-known for her beauty column in the Guardian and her own website, www.salihughesbeauty.com. Pretty Iconic is a pleasingly solid and chunky book of short essays about iconic beauty products. Now, this would be a truly lovely read if it were entirely about the obvious candidates - Chanel No5, Crème de la Mer, Touche Éclat and so on - and indeed, all these products do make an appearance. They are written about with warmth, wit and insight and it's a joy to read about them. But where the real genius of this book lies is in the decision to include alongside them many, many more offbeat and less glamorous choices. Rimmel Hide The Blemish, Carmen heated rollers, Immac, Head & Shoulders and even the monstrous scrunchie ... they all turn up here, and they're all written about with every bit as much affection as Mac Ruby Woo lipstick and Eve Lom Hot Cloth Cleanser. I'm sure not everybody feels the same way as I do about this stuff. I know not everyone is quite as nerdy as me about things you could buy in Boots in 1990, the nail polish Uma Thurman wore in Pulp Fiction or the specific Max Factor face powder worn by Hollywood icons of the 1950s*. But this book honestly moved me to tears. White Musk perfume and Morello Cherry Lip Balm took me instantly back to being 14 and spending my saved-up pocket money at The Body Shop with my friends during London shopping trips. My mum wore Rive Gauche in the 80s and I wear it myself now (and so should you; it will never not be good). I practically squeaked with excitement at the memory of Natrel Plus deodorant, which I made my dad buy me as part of the weekly shop from Tesco in my teens because the colour schemes of the different fragrances matched my bedroom. I wept at the observation that bath cubes have essentially died out with a generation of nans and if you don't cry at Sali's chapter on Old Spice and the memories of her grandad its scent still carries for her, or when she talks about the Revlon lipstick shade worn by her late friend Carey Lander, you probably aren't human. That said, there are plenty of chapters that made me laugh a lot too (Shaders & Toners and Girl's World spring to mind). I saw yesterday that Nigel Slater, my favourite food writer of all time, was praising Pretty Iconic on Twitter. If you like the way Nigel Slater writes about food (and agree with him that food, whether it's an eye-wateringly expensive lobster or children's penny sweets, means so much more than something to eat) you will also like the way Sali Hughes writes about beauty. It's a very personal take on the subject and a very evocative one. I should also add that the book is beautifully designed with a lovely font that reminds me of the most stylish, classic glossy magazines and fantastic photography that correctly treats Mr Matey bubble bath with as much reverence as Sisley Black Rose Mask. If there is anyone in your life who is fascinated by beauty and grooming - men's or women's - then buy it for them now, or put it under the tree on Christmas morning.